We look back on ‘an amazing ministry’ that’s been running since 1948. With those words, our CEO Mairi Johnstone launched an eight-page edition of our newsletter Roof ‘n’ Roots. 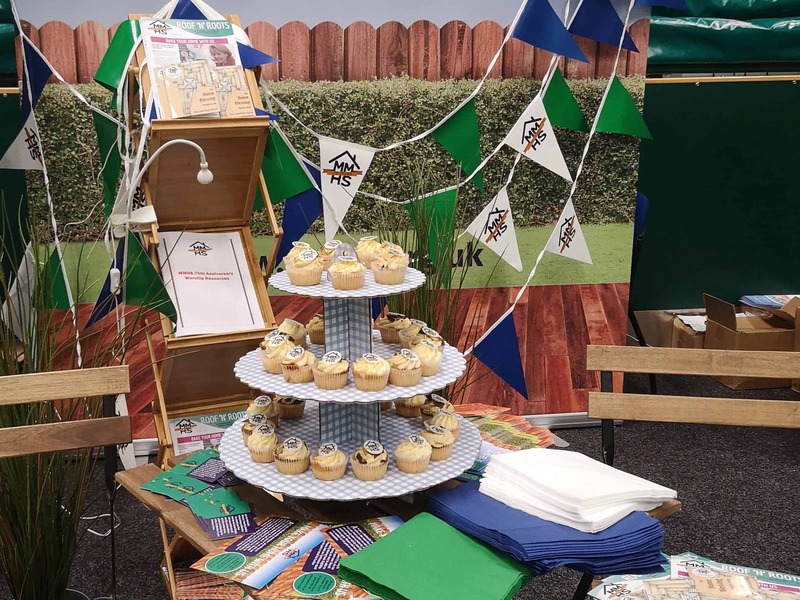 This special summer issue is part of our 70th anniversary celebrations, and was proudly displayed – alongside some delicious cupcakes – on our exhibition stand at the Methodist Conference at Nottingham University (pictured). Roof ‘n’ Roots is packed with a whole host of features – from a photostory about ‘RoboCrop’ our automated lawn mower – to an interview with the new Chair of our board Alex Campbell, who’s been described as leading the ‘Pink Floyd’ of brass bands. There is also a focus on one of our residents Revd William Farrell of Gloucestershire, who is celebrating his 100th birthday during our own anniversary year. Another resident, Revd Barrie Tabraham, reviews the Revised New Jerusalem Bible for us. Roof ‘n’ Roots also highlights the free resources given to residents and supporters during our birthday year – The Home Blessing Prayer Book and a new suite of worship materials. We’ve given every MMHS resident a copy of The Home Blessing Prayer Book – the first in a series of prayer books written and illustrated by Mary and Mark Fleeson. Other friends and supporters had the opportunity to take copies from our stand at the Methodist Conference. The worship materials have been published online and can be downloaded for free from the MMHS website. A limited number of hard copies were available at the Methodist Conference, where they were given to ministers and ordinands searching for service ideas. While compiling this publication, we discovered there are other organisations celebrating 70th anniversaries just like MMHS – from the NHS to Land Rover. As our CEO pointed out, 1948 was a significant year. You can download Roof ‘n’ Roots direct from our website. Please let us know if you would like printed copies for your church.